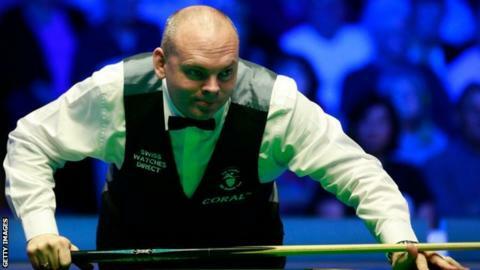 Stuart Bingham made a fifth 147 of his career in his match against Peter Ebdon at the China Open on Wednesday. Englishman Bingham pulled away from 3-3 to win the second-round match 6-3, making the 147 in the seventh frame. The world number 12 is only the sixth player to make five or more official maximum breaks, joining Ronnie O'Sullivan, Stephen Hendry, John Higgins, Ding Junhui and Shaun Murphy. It marks the 151st maximum break in snooker history and 12th of the season. Bingham, the 2015 world champion, is now in a line for a £27,000 bonus if his 147 is not equalled this week. "To make a 147 on the TV table is brilliant. I'm sure my wife and family will be pleased because we have just booked a holiday to Tenerife so hopefully that's it paid for," he said. Elsewhere, England's David Gilbert lost 6-3 to Scotland's Scott Donaldson in the last 32 of the competition and will have to wait for other results to find out whether he will be in the top 16 seeds for the World Championship, which starts on 20 April in Sheffield. With Mark Selby defeated in the qualifying round and world number one O'Sullivan absent, Australian world number seven Neil Robertson is the highest-ranked player left in the tournament. Robertson came from 3-1 down to beat China's Mei Xiwen 6-3, reaching the last 16. "At 3-1 down I was thinking about booking the next flight home. After the interval I was aggressive and played very well. I made a ridiculous clearance to go 4-3 up, that was the best clearance I have made this season," Robertson said. "This has been my best season and I am in the best form of my career at the moment, I am very proud to have reached the last three finals. I will enjoy the rest of this week and everything is good looking ahead to the World Championship."